Unhealthy Threshold: Specifies the amount of time, in seconds, that the Router continues to accept connections before shutting down. During this period, the healthcheck reports unhealthy to cause load balancers to fail over to other routers. You should set this value greater than or equal to the maximum amount of time it could take your load balancer to consider a router instance unhealthy, given contiguous failed healthchecks. Healthy Threshold: Specifies the amount of time, in seconds, to wait until declaring the router instance started. This allows an external load balancer time to register the instance as healthy. You can configure these properties from the Settings > Network tab. The interval between step 2 and 4 is defined by the Unhealthy Threshold property of the Gorouter. In general, the value of this property should be longer than the value of the interval and threshold values (interval x threshold) of the load balancer. This additional interval ensures that any remaining HTTP requests are handled before the router shuts down. 6 The router restarts. 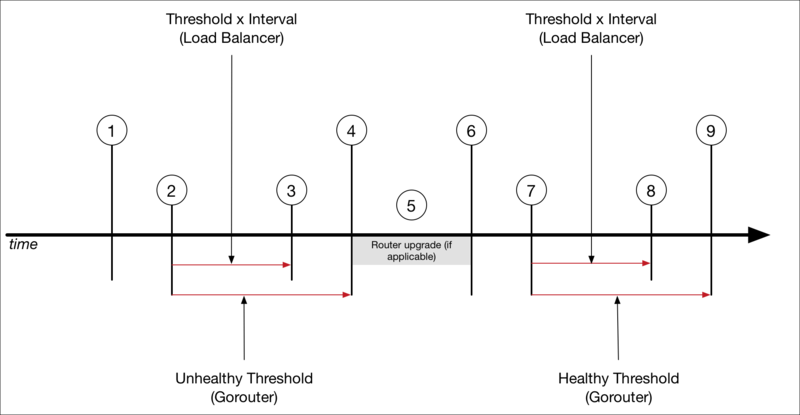 The router will return Service Unavailable responses for load balancer health checks for 20 seconds; during this time the routing table is preloaded.